This Elstead Franklin retro style industrial table lamp in gloss cream finish features a wide brimmed shade with gloss white inner and curved arch in polished chrome. 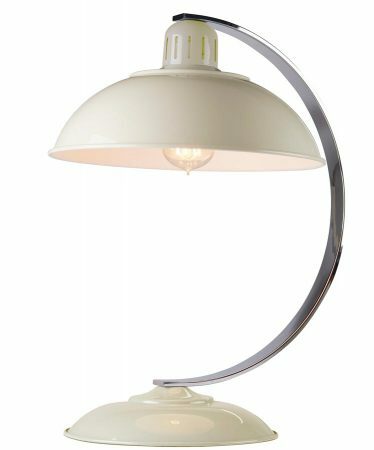 An industrial style bureau lamp manufactured from steel, boasting a circular base and domed shade finished in cream, with white inner to reflect the light, curved bright chrome stem, cream flex and inline switch. The gloss cream outer contrasts with the gloss white inner to give it an up to date look and feel. The arched polished chrome stem and circular base is stylish and will add the finishing touch to any interior. It is well suited to placing on a sideboard or office desk and is the ultimate accessory for the modern stylish kitchen. There is a matching pendant ceiling light available; please see below. This stylish light is supplied by Elstead Lighting, a British company that specialise in the manufacture and distribution of quality decorative lighting such as the Franklin retro style industrial table lamp in gloss cream finish you see here.